A water molecule is composed of two hydrogen atoms and one oxygen atom. When the molecule loses a hydrogen atom, the remaining OH molecule takes on a negative charge. As you walk along the beach, your body absorbs millions of these negatively charged ions, which alkalize the blood and tissue. This is why you feel so good walking on the beach. Because of poor diet and high stress, we tend to accumulate and store excessive quantities of waste products such as diacetic, lactic pyruvic, uric, carbonic, acetic, butyric and heptic acids. 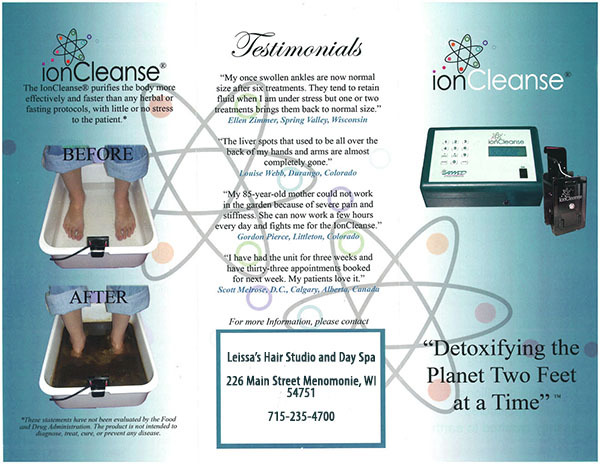 The IonCleanse creates precisely the same environment as the walk along the beach, only more powerfully because your feet are in direct contact with the ions being manufactured in the water. Place your feet in the water, turn on the unit and within second, millions of ions enter your body and begin to neutralize these tissue acid wastes. The particles, fat and mucous residues found in the water after bathing reflect the wastes that have left the body during the 20 to 30 minute session.